Growing: Â Moderate This wonderful hybrid marijuana strain is slightly sativa dominated and the result of crossing Kushage and pure landrace Afghanistan cannabis. 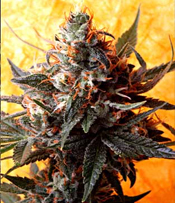 Â The result is a 40% indica and 60% sativa genetics that has good medicinal properties and can be grown whether indoor and outdoor which makes it perfect for beginners who have at least a basic understanding of marijuana cultivation.Flowering time for Double Kush marijuana plants can be expected once it reaches 9 weeks in an indoor growing set-up and by end of October in an outdoor system of growing. Â It will grow colourful buds with red to orange hairs and purple leaves around it. Â High yield can be expected especially if it is grown in a hydroponics set-up. Â The buds will emit a deep spicy sweet aroma and this will be carried up to its taste. Â As for the effect when smoked, its sativa lineage will deliver a clear-headed cerebral high with a full body relaxed feeling. Your website isnt just edointcuaal but really creative too. There are frequently very a number of people who can create not really easy content articles that artistically. Continue the superb composing !! Good day! Do you know if they make any plugins to asisst with SEO? I’m trying to get my blog to rank for some targeted keywords but I’m not seeing very good success. If you know of any please share. Thank you!